Tomorrow is the final day for the English Premier League current season. If you love watching live football broadcast like I do, you wouldn't want another statewide blackout tomorrow at 11.00pm Malaysian time, or at any time for that matter. However, Sabah's SESB is notoriously known for power failure during crucial times. Reliability is not in their dictionary, they are far from being reliable. 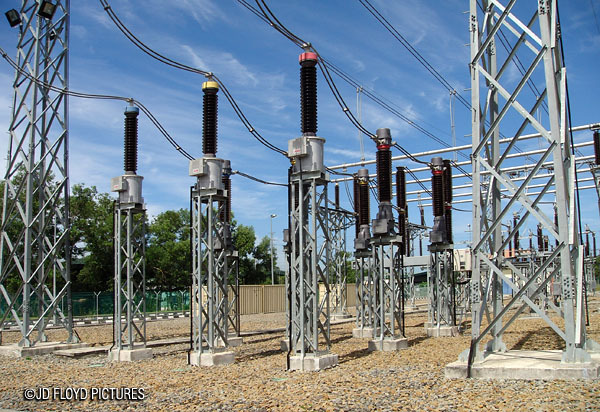 Typical main intake substation (PMU): Do you think SESB is a reliable power provider? Supposing the 2012 figure did not take into account the statewide power failures on 30 April - 1 May, this year's SAIDI could probably surpass the 2011 figure. This index measures the total duration of an interruption for the average customer during a given time period. This is the most often used performance measurement for a sustained interruption and is normally calculated on either monthly or yearly basis. To calculate SAIDI, each interruption during the time period is multiplied by the duration of the interruption to find the customer-minutes of interruption. The customer-minutes of all interruptions are then summed to determine the total customer-minutes. To find the SAIDI value, the customer-minutes are divided by the total customers served. What is the SAIDI for 30th April and 1st May given the following data? Table 1 shows each power outage, the duration of the outage, and the customer-hours. As of August 2011, SESB has 456,406 customers. From the table, the first outage was at 3:23 in the morning and 456,000 (approx.) customers were out of service for 20 minutes (0.33 hours). The 20 minutes was based on the statement made by SESB that the utility started normalising supply in stages as early as 3.40am that day. This means that the average customer was out for 158 minutes on the 30th April - 1st May 2012. 3) If you are living in Sabah, last year you would have experience 494 minutes of power outage, or slightly over 8 hours for the whole year. Take this year's 30th April statewide blackout into account and you are already more than 8 hours without power supply. Expect double of that figure by year end. Parting shot: Who verify your figures? We now know how SAIDI is calculated. What we need next is transparency in terms of data verification. Someone has to look into the utility's method of calculating it, just like what is done in financial audit or quality audit. SAIDI or what not,the reality is there is an acute power shortage in Sabah,it could have been averted if the earlier planned coal fired power plant was build,now we'll just have to wait for Kimanis plant. Having the state government as a shareholder in SESB seem to the doing no good,TNB should have been left alone.